Following an earlier Rafflecopter usage improvement tip for bloggers, here's a new one. 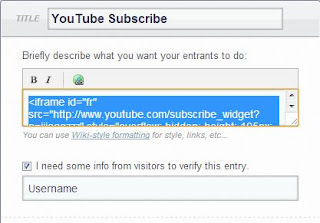 Did you know that you can embed the YouTube subscribe widget right inside Rafflecopter so that someone can subscribe without having to leave the Rafflecopter entry form/widget? 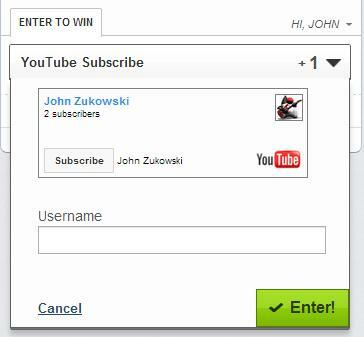 As seen in the picture above, it is really easy and a big improvement for those entering your giveaways. 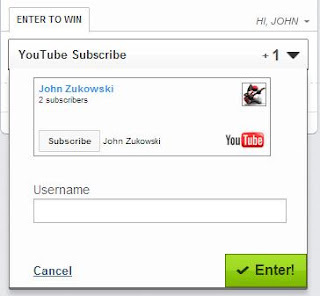 Just place the below code in Rafflecopter as shown above, replacing <username> with the actual YouTube username, leaving off the < and >, too. Thanks for this great How-to! I always wondered how this was done as it makes entering so easy! Did exactly what you said and it didn't work for me. Did you replace all of with the username you wanted? What error did you get? It worked in 2013. I don't use Rafflecopter any more. Perhaps they changed things in the two years since.